There were probably at least 20 on Spatterdock Pond, along with a big flock of Wood Ducks. Ducks are so skitterish… I was pretty far back in the woods and I still managed to spook them to the other side of the pond! 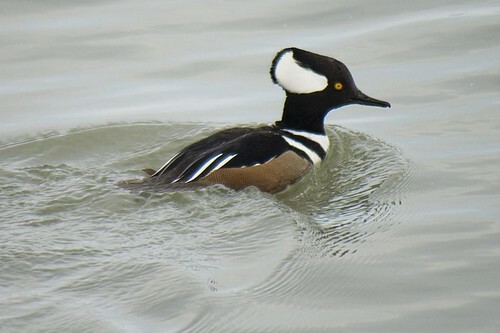 The Hooded Merganser (Lophodytes cucullatus) dives underwater to hunt for fish. Like the Wood Duck, it nests in holes in trees. The female is brownish. The male can lift the hood to present a very large white circle. I am envious of your recent bird sightings. All the ponds around here are still frozen over, but the ice has come off the river in most places. That photo looks familiar! LOL Sounds like a great day and I also love these mergansers! I love your new header on this blog and I bet you can’t guess what I got in the mail today . . . . Winter Fungi! Very nice book and one that I suggest everyone gets for their bookcases! 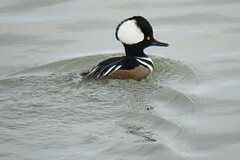 I saw Hooded Mergansers on Walker Creek about a month ago. I guess they must have been just passing thru because I have not seen them for a couple of weeks.